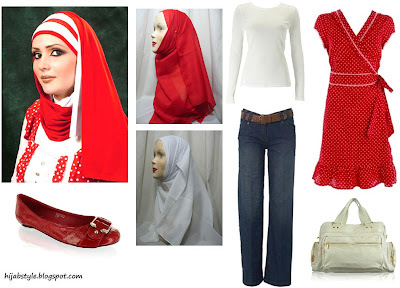 Red hijab £1.50; white hijab £1.50, both 2hijab; white long sleeve top £5.60; wide leg jeans £30, both Dorothy Perkins; polka dot dress £28, Debenhams; red patent ballerina flats £18; shoulder bag £25, both Barratts. That is really cute! Yes, I also noticed her cute outfit. I think you would need white pants to actually really match the outfit. Personally I can't stand to mitch match everything. Thanks everyone, glad you liked it! Sarah, I think what she's done here is worn a red bandana first. Then she's taken the white hijab, placed it on her head one side long than the other, than taken both ends behind the neck and pinned them. The she repeats this with the red hijab. Then the long end of the white one is taken over the shoulder, around the neck and back up over the head. Repeat with the red hijab, and make sure to secure with pins. Hope that made sense! maybe it's too matchy.. but for those people ..
these shoes would look cute too..
awwww i just looked on the website n they dnt have the dress nemore!! oooo very cute i love red!